Earlier this week I was injecting an ankle: was I in the joint or not? I ‘think so’–but with an ultrasound I would ‘know so.’ Perhaps that is all I really need to say in this blog post on sports ultrasound! Readers of the journal and this blog will be familiar with the Mayo Clinic’s Jonathan Finnoff. Dr. Finnoff has made substantial contributions to the field of sports ultrasound and most recently was the lead author on a highly cited review of this modality. I had the chance to interview him and profile this work, an American Medical Society for Sports Medicine position statement, in our December 2014 podcast featuring him. Dr. Finnoff headed a highly regarded sports ultrasound program at the recent 2015 AMSSM conference in Florida. I arrived a day late for that, and so could not attend. Not only did I want to go to that program for its educational value, I wanted to meet the man himself! As I have written, it is both a wondrous and strange attribute of the modern world to become so engaged with someone on Twitter, or Skype, and yet never meet them in person. I am happy to say my disappointment was short-lived as the busy doctor was able to come visit Columbus, Ohio yesterday. I was able to catch the sports medicine grand rounds he delivered at Ohio State and get to shake, at last, the hand that holds the transducer. Jonathan: it was good to finally meet you! If you have never had the chance to hear him speak, make sure you avail yourself of the next opportunity [or listen to the podcast :)] In the mean time, I wanted to share some of what I came away with from the talk. I do not use sports ultrasound in my practice, but I know I must–and soon. This professional gap owes to my age (it wasn’t offered as part of my fellowship training) and to issues surrounding accreditation of non-radiologists in the place where I currently work. Walking away from Dr. Finnoff’s talk I know I have to close this gap. In his review of the evidence and in the presentation of several case studies, Dr. Finnoff made a compelling argument for the power of this modality to enhance interventions we offer our patients. Ultrasound-guided injections, as compared to ‘blind injections’ (or as Dr. Finnoff more graciously put it, ‘palpation guided’ injections), are 1) more accurate; 2) more efficacious; and 3) reduce costs. These are evidence-based statements, citations to be found in the AMSSM position statement available in our journal. 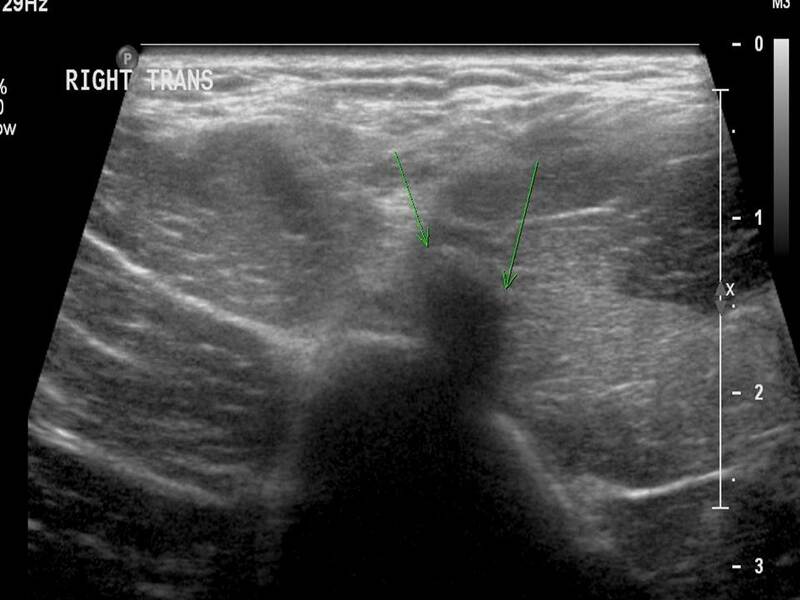 Proximal biceps tendon rupture as seen on ultrasound. Regarding the diagnostic capabilities of point-of care sports ultrasound, he emphasized the power of having a dynamic imaging modality as opposed to a static one. MRI is a powerful tool we sports physicians use frequently, but it generates static images. Ultrasound can much more readily demonstrate a subluxing peroneal tendon, for instance, or (in a case study Dr. Finnoff presented) demonstrate that not all snapping hips are attributable to the iliopsoas or tensor fascia latae. Furthermore, ultrasound is much cheaper and more portable than MRI. And concerns over patient claustrophobia or implanted shunts are no longer concerns when ultrasound is employed, not to mention the superior safety profile of ultrasound compared with imaging relying on ionizing radiation (e.g. CT scan and plain films). 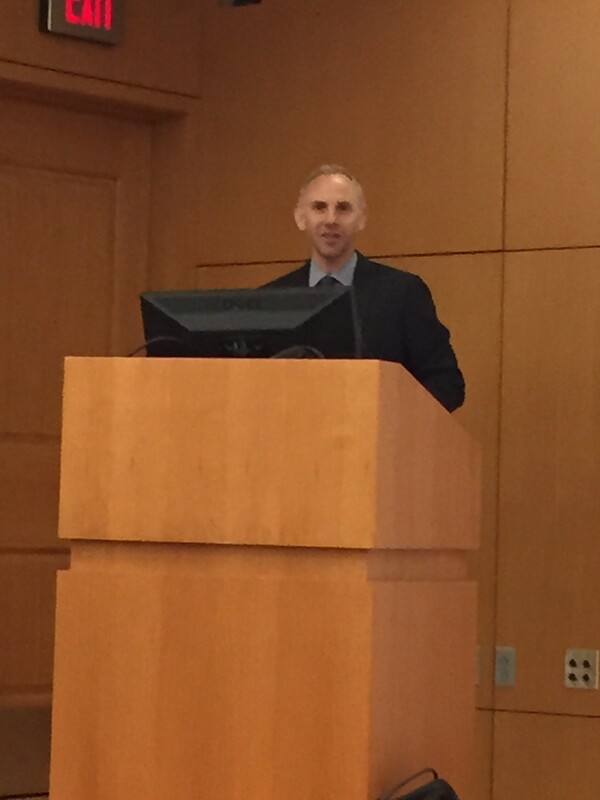 At the end of his talk, Dr. Finnoff made what I think is possibly the strongest argument for increased utilization of sports ultrasound: it, more than MRI as an example, achieves the ‘triple aim’ of the accountable care concept gaining traction in American healthcare delivery–cost effectiveness, appropriate use, and enhanced patient satisfaction. Physician payment will increasingly be tied to demonstrated cost savings and improvement in patient outcomes and satisfaction. There is strong evidence to support point-of care sports ultrasound as a means of achieving this triple aim, and our reimbursement may depend on it. ‘Think so’ vs. ‘Know so’: I’ll end with a story Dr. Finnoff showed in his talk. One of his published works, cited in the position statement, describes work he did with a colleague on ultrasound- vs. fluroscopic-guided piriformis injection. On his arrival at the Mayo Clinic, he got into a friendly debate with a colleague who, when performing the latter procedure, ‘knew’ he was in the right place. Dr. Finnoff demurred, and so the two did a cadaveric study comparing the success rate of the two procedures. This published study demonstrated that piriformis injections done under fluroscopy were accurate only 15% of the time, whereas those done under ultrasound guidance were 95% accurate! Our patients surely want us to be more in the 95% camp than the 15% camp!!! And we professionals demand of ourselves that we ‘know’ and not merely ‘think’ or suppose something. Do you use sports ultrasound in your practice? Let us know here or @cjsmonline on Twitter!